One of the easiest things you can do to give your bathroom a new look or create more space is to install a new bathroom vanity. Whether your bathroom is contemporary or traditional, modern or ornate, there is a perfect bathroom vanity available to suit your style. Single bathroom vanities offer just the right amount of space for guest bathrooms or smaller bathrooms. You can find vanities that feature pedestals or floating wall-mounted designs as well as free standing units that make great use of storage and cabinets. 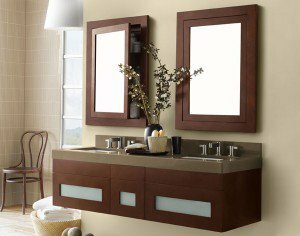 Double bathroom vanities will definitely improve the comfort level if you are currently sharing your bathroom with another member of household. Increase counter space, cabinet space and “his and hers” areas. Double vanities are also great for kids bathrooms where there are more than one child using the bathroom. These types of vanities also offer lots of storage space for towels, toiletries and supplies, which reduces clutter and helps you to stay better organized. Depending on your style preference you have many different materials and woods to choose from. Surfaces include anything from marble, ceramic, granite, cultured stone to composites. Woods include cherry, oak or even mahogany. These woods are priced differently depending on their strength and durability. It often pays in the long run to spend a little more if you can afford it. Bathroom vanities can also come in glass designs, which are a much more contemporary look. The glass is high-end and very durable and often combines with other material finishes such as wood or stainless steel to create a very custom, stylized look and feel. Many glass vanities are of the wall mounted variety. This creates a feeling of openness in the bathroom while also providing great functionality. Whatever style of bathroom vanity you’re looking for, the best way to make sure you have covered all your bases is to hire a professional bathroom remodeler. They can show you all the designs, materials and installation choices, and they can help you save time and money. Earlier this year more than 350 members of the National Kitchen & Bath Association (NKBA) participated in the 2012 NKBA Design Trends Survey to give their opinions about products, styles and designs that they view as becoming more popular with homeowners. Each member is a designer and specialist in bathroom or kitchen remodeling and their views tend to reflect what is happening in their specific market, however, the survey did show some common trends remodels in general throughout the U.S. and Canada. For bathrooms one of the surprising comebacks is the bathroom medicine cabinet. Having been relegated to secondary status in recent years, people are finding that new and updated medicine cabinet designs allow for more efficient use of space when space is limited. Traditional bathroom designs are no longer, well, traditional. Transitional is the latest buzzword when it comes to bathroom remodels, which incorporates elements of traditional and contemporary designs that create a modern classic look. For bathroom vanity tops it’s all about solid surfaces. Granite and Quartz are still the most popular choices but Marble has taken the third spot and is trending higher. Other solid surfaces, such as glass, have also made a big jump in popularity as more styles and choices have hit the marketplace. As far as color choices go, gray seems to be all the rage this year with that color choice having more than doubled in popularity in the last two years. Gray color schemes can be very attractive and distinguished without overpowering the look and overall bathroom design. Other popular choices include beiges, browns, bronzes, terracotta and greens. Although brushed metal finishes have been rather standard equipment for many years when it comes to fixtures and hardware, perhaps one of the big surprises from this year’s survey was the comeback of polished chrome. Brushed nickel and brushed chrome is also down from the previous year along with satin nickel. Stainless steel has managed to retain its popularity as well as bronze. Since trends do tend to change from year to year, it’s important to consult with a professional bathroom remodeler to get the latest most up to date information on popular trends and how to remodel your bathroom in such a way that can incorporate your favorite styles and create lasting functionality and design. One of the easiest things you can do to dramatically improve the overall look and feel of your bathroom is to install new tiles. Since tile is permanent, it becomes a long lasting and durable upgrade that makes a great impression on guests and potential homebuyers. Since the bathroom is one of the most frequently used rooms in your home, investing a little bit of time and money can go a long way to improving its overall value and enjoyment. Here are a few tips you can use when choosing the right tiles for your bathroom remodel. Bathrooms are high moisture, and sometimes damp, environments, therefore many types of natural stone may not be suitable due to their porous nature. Natural stone requires more care and treatment in order to be maintained where there is lots of exposure to water. For that reason, many homeowners gravitate towards glass, porcelain, and, of course, ceramic surfaces. These materials are highly durable, relatively easy to install, and require less maintenance. The size of tiles you choose can also make a big difference. Sometimes larger tiles on walls can give the illusion of a bigger room in a subtle way, while smaller tiles can create a “busy” effect. For those on a budget, who may not be in a position to tile the entire bathroom, it’s possible to improve the look of your bathroom by using accent tiles, or perhaps, a backsplash for tubs or sinks. It’s recommended that smaller bathrooms utilize light-colored tiles as this tends to open up the room and give the impression of having more overall space. When choosing tile for showers, most people prefer ceramic because it is durable and easy to maintain. There are also an almost endless number of colors and patterns that you can pick from when going with ceramic tiles. For floors we recommend looking at warm or neutral colors. The floor is also meant to be durable and easy to clean, but it’s not where you want to draw the eye. Flooring tile should not be the first thing one notices when entering the bathroom, but rather, it should complement the tile or décor on the walls. If you want to get creative with your tile design, an easy way to do it is to lay the tile in a diagonal fashion, rather than in a grid pattern. You can also choose tile that is uneven or irregularly shaped in order to create a more interesting pattern or effect. You can also experiment with color shades, using gradients or color patterns that create subtle shapes and layers. The texture of the tile can also add an interesting effect. Some surfaces may be smooth and shiny, while other may have more of a matted or rough appearance. Since many people use their bathroom as a place to relax or unwind, you may want to consider keeping your tile design more subdued than “exciting”. Loud colors, ornate patterns or distracting designs may take away from this relaxing atmosphere you’re trying to create. When choosing new tiles, it’s highly recommended that you enlist the help of an expert. Home improvement centers, bathroom retailers and bathroom remodeling contractors are all useful resources when it comes to choosing the right tile and getting installation tips. If you think that installing tiles yourself is a bit out of your element, then hiring a good, licensed contractor is probably the best decision you could make. Before attempting any bathtub or shower installation, keep in mind that this is really a job for a professional contractor. It is not a simple process and can be very costly. There are a variety of different types of tubs and sizes, widths and styles. If you have experience with bathtub installation and feel confident in your abilities to perform the work, then here are some basic guidelines for getting the job done right. Before you start take careful measurements and make sure that the new tub approximates the size of the old tub. If not, then you may have to make additional modifications that may or may not work. For the bathtub installation you’ll need to start by removing the existing bathtub. That will require you to open up the three surrounding walls. You may also have to remove some of the adjacent fixtures such as toilet, sink, vanity or other bathroom furniture. You may also need to remove the base moulding, floor covering and underlayment because they will also need to be replaced. If you have tiles on the walls take care to ensure that you minimize the possible damage or you may have to replace the tile. This is by no means a one person project, so make sure that you have one or two other people to help you with moving and positioning the tubs during the project. If you’re not a professional plumber, then it may be wise to have one handy to help you with the connections and tubing that will need to be changed out during the process. Shower installation also requires careful planning and should be performed by a professional contractor, if possible. The type of shower enclosure you’re going to use has to be one of your first decisions. Is it compatible with your current enclosure in terms of size, style and plumbing requirements. If the shower is not in the bath, and you don’t already have a shower, then you need to consider the placement of the shower and whether it will work with your existing plumbing configuration. Decide whether or not you’ll need shower tiles and what kind of shower pan you’ll be using. Before you start your shower installation project, you may want to visit a bathroom supply showroom to find the hardware you want to include in your shower such as shower head, handles and any other accessories you may prefer. Another important choice you’ll need to make is the type of enclosure you want. 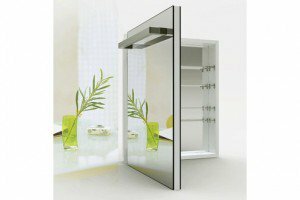 Steam shower doors are very popular and this may be preferable to other types of enclosures like plain curtains, glass or Plexiglas doors. Some showers have no enclosure at all. Take into consideration the entrance and the size of the curb. You may prefer to have a curbless entrance, which would be especially helpful for those who are physically challenged or wheelchair bound. As stated previously, shower and bath installation is challenging and should be performed by an experienced contractor or someone with experience. Take your time to plan the project and write out all the steps you’ll be needing to take along the way and make sure you perform each task in it’s proper order. Make this a team project and most importantly, don’t rush the work. Taking time to do it right will ultimately make for a satisfying result. Bay area Bathroom remodels are becoming more and more popular as the housing market has slowed because more people are choosing to stay in their current home rather than cashing out their equity and upgrading to a newer home as they were doing not so many years ago. Now the focus is on upgrading the home you’re living in and for many homeowners that starts with new bathroom designs. One of the best places to start is with choosing new fixtures. Bathroom fixtures can easily and, in some cases, inexpensively improve the look and feel of any bathroom design san jose by creating an esthetic enhancement as well as functionality. Although it may be tempting to find the “best bargain” on fixtures, keep in mind that better quality fixtures will last longer and add to the value of your home over time. High quality fixtures look better and make a better impression on guests and potential buyers. You may want to visit your local bathroom retailer to get more information on the types of fixtures that are available and pricing information. You can also look at consumer reports online. If you’re going to replace the tub, spend a little time deciding what type of tub you’re going to be installing. Is it a freestanding tub or not? Will it have jets? Maybe you’ll need a walk-in tub for someone in the home who is physically challenged. The choice you make on the tub will determine the amount of work and cost of the overall project. For many tub installations it will be necessary to re-tile large areas of your bathroom. You will also need to take into consideration the plumbing requirements. For showers there are similar concerns that need to be addressed. One of the advantages of showers is that the space can be much larger and accommodate other types of fixtures, such as hand held shower heads. Showers can also include multiple sprayers for “full body” coverage. You can also include a shower seat for elderly or physically challenged users, as well as wide, curbless entry for someone who may be wheelchair bound. There are many different eco-friendly fixtures and materials that can help you “go green” and help the environment. Low flush toilets save on water, as do other types of faucets and shower heads. Surface materials can be made of reclaimed materials like glass and woods can come from species like Bamboo which are highly sustainable. For Bay Area homeowners looking for new and interesting bathroom designs, the most difficult part is usually just getting started. There are so many choices and options available that, if you haven’t done your homework, could have you really scratching your head. The good news is that for Bay Area bathroom remodels there are plenty of resources to get you on your way to a new, exciting bathroom design. In San Jose there are many exceptional San Jose bathroom remodeling contractors who can guide you through the process, showing you interesting concepts, fixtures, wall materials, tubs, showers and vanities. They are also the ones who can give expert advice on the cost of such a project and the best way to stay within your budget. If you don’t already know a bathroom remodeling contractor, one of the best referrals you can get is through your local kitchen and bath showroom. They will often work with many of the best contractors in the Bay Area and can probably give you a handful of calling cards. First, you’ll need to determine what your particular style is. Do you want a bathroom design that will complement your current home décor? Do you prefer classic, country, contemporary or ornate? What will be your color scheme? Do you have certain wood preferences that will match what you have going on in the rest of the house? Do you have any special needs for occupants with physical disabilities? These are all important questions to ask yourself before beginning any bathroom remodeling project. Go spend some time in your bathroom and try to imagine everything you’d like to change and how you’d like to change it, then make notes on all your thoughts. Write down any questions you have about installation, products and costs for when you meet with your contractor. Take a look online or in magazines at other bathroom designs for inspiration. You may not even realize the various options or creative possibilities that exist until you’ve had a chance to see what other Bay Area bathroom remodels look like. Go to your local Bay Area bathroom retailer and explore the various fixtures, woods, tiles, tubs and showers available and get some ideas on pricing as well. Ask lots of questions and always find out which products are most durable and come with manufacturers warranties. Decide if you want your new bathroom remodel to be eco-friendly. There are entire product lines dedicated to using green, sustainable materials, like Bamboo, and environmentally friendly fixtures like low flush toilets. Make a wish list of all the conveniences you’ve ever wanted in your bathroom and then discuss those ideas with your bathroom remodeling contractor. Ever wanted a TV in the bathroom? How about a telephone? Maybe his and her vanities or for some real, European style comfort, a bidet? Bathroom remodels are a big investment and you may only do this once during the entire time you own your home, so if you’re in the Bay Area bathroom remodels and custom bathroom cabinets market, this can be your chance to have the dream bathroom design that you’ve always wanted. If you’ve ever thought about remodeling your bathroom the first thing that usually comes into your mind is, “How can I possibly afford it?” After all, according to Remodeling Magazine’s 2005 Cost vs. Value Report, the cost for an average sized bathroom remodel is about $10,500! That could be less or more depending on where you live, but regardless, for many people it is a large sum of money. You also want to consider if the investment is worth it. What is the reason for wanting to do the remodel? If you’re looking to update your home for an upcoming sale you’ll want to be sure that you can recoup that investment in the final sale price of the home. On the other hand, if you’re doing a bathroom remodel just because your current bathroom is outdated or in disrepair, the return on investment may not be such a pressing issue. The good news is that, according to the same report, most bathroom remodels will recoup about 102 percent of the overall investment. For upscale Bay Area bathroom remodels , it’s possible to spend upwards of $26,000 dollars. The costs add up fast when you’re looking at higher quality furnishings, fixtures and materials, so it’s very important to start with a budget in mind and try to stick to that budget. One of the first steps in getting your bathroom ready for remodeling is tearing everything out – also known as “demolition”. One way to save some money on this is to invite some friends over and do it yourself. You may want the advice who knows something about contracting so you don’t do any unnecessary damage, but if you hire a contractor to do the work for you it will definitely add to your overall cost. Labor, in general, is one of the biggest cost factors in any remodeling job, so if you can find a contractor who will allow you to participate in the work it could also help to bring down costs. There are some tasks involved that require little or no experience. Fixtures can be very costly, especially if you plan on rearranging the location of the sink, toilet, bath or shower. Then you’re looking at some major plumbing work, and we all know about the price tags for plumbing jobs. The fixtures themselves can also really add up. Do you want a $200 dollar toilet or a $2000 dollar toilet? The choices are limitless. Tile is another item that has wild price swings. You can find lots of surface materials that are attractive and durable and that won’t break the bank. Swanstone is one good alternative. Another is plain old ceramic tile, of which there are a myriad of styles and colors to choose from. When it comes to tubs, showers and vanities, choose carefully here as well. Spend some time at your local bathroom showroom can save you lots of money because it is a place where you can really do your research. Find those items that reflect your taste and design preferences yet are still in your price range. Go online and look at various manufacturer websites. See who’s got, not only the best pricing, but also the best warranties. When it comes to bathroom remodels South Bay , a little bit of shopping can save you lots of money. For people with special needs, the very mundane tasks of daily living can become very burdensome to an individual who is either disabled or confined to a wheelchair. A typical trip to the bathroom can require a tremendous amount of patience and can turn into a tedious and sometimes frightening experience. One of the daily bathroom activities that most of us take for granted is taking a shower or a bath. Fortunately, there are many solutions available in the form of specially designed products which help those with disabilities or advanced age to get in and out of the bathtub without fear of injury or strain. The “Walk in Tub” also known as a handicap tub, handicapped tub or “Bathtub with a Door”, is one of the most useful and helpful breakthrough in bathroom amenities for individuals with special needs. These tubs offer more safety and mobility for folks who are physically challenged than conventional bathtub designs. Sometimes people will try to convert their regular tub into a handicap tub by adding grab bars or benches, but in truth, these traditional tubs were never designed with the disabled in mind. These types of modifications may make certain aspects of getting in and out of the tub easier, but do not offer the comfort, stability and safety that those who have special needs require. Handicapped tubs, or Walk-In tubs, truly enhance the daily living experience of those who need them because they are designed specifically for individuals who are physically challenged. There are many excellent manufacturers and styles to choose from, depending on a person’s particular tastes or needs. There are also a variety of handicap showers available as well, fitted with grab bars, benches, wide clearance doors, hand held shower heads, drainage and entrances that allow for easy wheelchair access. When looking for a handicap tub or handicap showers, it’s important to keep in mind several things. Is the tub or shower registered with the US Government FDA as a medical device? Does the tub meet or exceed HUD and ANSI requirements? Does the tub or shower allow for wheelchair access? Does it come with a bench, grab bars and custom fixtures? Will the tub or shower fit your current bathroom design or will you need a complete bathroom remodel? Does the tub or shower have a slip resistant floor? Does the tub or shower have a warranty? One major benefit of owning a handicapped tubs or handicap showers is the convenience it also offers to caregivers. Your family loved ones and caregivers will greatly appreciate the ease with which one can be assisted in and out of one of these indispensable bathroom products, as much as the user will enjoy the experience of using them. These days, everyone is thinking about the environment – and for good reason. With the explosion in population around the world there’s no question the human impact is putting a strain on our natural resources. And regardless of where you may stand on the climate change issue pretty much everyone agrees that we must all be good stewards of this planet we call home. For that reason, there’s been a tremendous interest over the last couple of decades in finding more environmentally friendly and sustainable ways to improve our homes. Eco-friendly designs, as they are often called, are more often than not the preferred way to approach many building and bathroom remodeling projects. 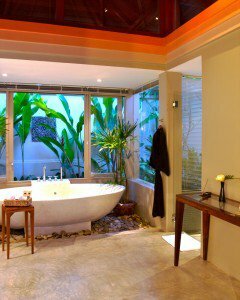 If you are planning on a new bathroom remodel, you may want to consider going with a green bathroom design. The cost, in many cases, can be very similar with standard remodeling projects, it’s just a matter of knowing where to look for the right materials and professional bathroom remodeler who knows the ins and outs of eco-friendly bathroom remodeling. There are many simple things you can even do yourself that will increase the efficiency of your bathroom. For instance, faucets and shower heads that utilize aerators use about half as much water flow but with nearly twice the power as standard fixtures. Also, in the water-saving fixtures category, you can have a low-flow toilet installed which will also use about 50% as much water as their regular flow counterparts. For flooring, wood paneling and cabinetry, you can look into using eco-friendly wood products. One of the choices environmentally conscious remodelers will look to is “reclaimed” or “recycled” woods. These are wood products derived from previous sources and remanufactured for other purposes. The great benefit to these products is that they don’t require any further harvesting of live forests. You can look for the “Smartwood Rediscovered” label which signifies certification by the Rediscovered Wood Initiative of the Rainforest Alliance’s SmartWood program. Another popular wood choice is Bamboo. Eco-friendly Bamboo wood is popular because is harvested from sustainable sources and has beautiful, durable look and feel. Bamboo forests can mature in just five to seven years, compared with other types of woods that can take over 100 years, in some cases, to reach full growth. Bamboo is also a very cost-effective wood and can save you money versus some of the more common woods used in remodeling projects. As for bathroom tiles, an eco-friendly bathroom tile option is recycled-content tile. Recycled-content tile can be used for walls, floors or countertops and is often derived from recycled glass or other renewed materials from the manufacturing industry. The benefit to the environment is significant because it helps to reduce landfill waste. These tile products are also extremely sturdy and resilient, and usually longer lasting than typical tile materials like linoleum. You might be surprised at just how attractive many of the surfaces are coming from recycled materials, and, like many of the other green products available, they will save you money while helping to save the environment. When you’re ready for your next bathroom remodeling project, take a look at the many eco-friendly products available. If everyone does just a small part, together we can make a big difference!